Never have I doubted my soundness of mind as often as I did on that first night, when the bird-woman and her wards came to save me from the madhouse. That’s where I was going, pinned between beefy uncles in the back seat of my parents’ car, when a wall of peculiar children seemed to leap directly from my imagination into the driveway before us, aglow in our high beams like a formation of angels. We skidded to a stop. A wave of dust erased everything beyond our windshield. Had I conjured their echo, some flickering hologram projected from deep within my brain? Anything seemed more believable than my friends being here, now. Peculiars had a way of making anything seem possible, but a visit from them was one of the few impossibilities of which I could still be certain. It had been my choice to leave Devil’s Acre. To go home again, where my friends couldn’t follow. I had hoped that in returning I might sew together the disparate threads of my life: the normal and the peculiar, the ordinary and the extraordinary. Another impossibility. My grandfather had tried to sew his lives together too and failed, estranged in the end from both his peculiar family and his normal one. In refusing to choose one kind of life over the other, he had doomed himself to lose both—just as I was about to. I looked up to see a figure moving toward us through the clearing dust. It’s strange, what the mind can digest and what it resists. I had just survived the most surreal summer ­imaginable—skipping back to bygone centuries, taming ­invisible monsters, falling in love with my grandfather’s time-arrested ­ex-girlfriend—but only now, in the unexceptional present, in suburban Florida, in the house I’d grown up in, was I finding it hard to believe my eyes. Miss Peregrine was talking to Hugh by the open fridge. They looked jarringly out of place amid the stainless steel and hard edges of my parents’ modern kitchen, like actors who had wandered onto the wrong movie set. Hugh was waving a package of ­plastic-wrapped string cheese. We had only two neighbors: ancient Mrs. Melloroos, a ­wheelchair-bound octogenarian who only left her house with the help of a live-in nurse, and a German couple who spent most of the year elsewhere, leaving their Cape Cod–style McMansion empty except during the winter. The words had hardly left her lips when a percussive, wall-­rattling crash sounded from the direction of the garage. The vibrations sent glasses toppling from a nearby shelf to the floor, where they shattered. 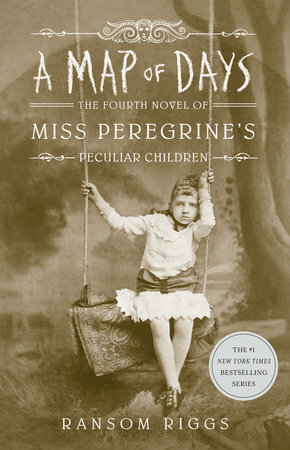 New MISS PEREGRINE: Start Reading A MAP OF DAYS now!